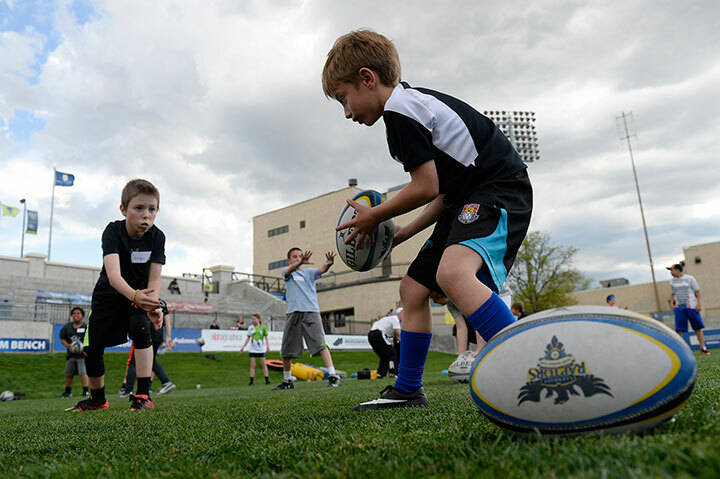 The Glendale Raptors has emphasized youth programs since its founding. Programs offered through the Glendale Raptors Rugby Academy are a good way to bring the sport to a new audience as young players learn rugby skills and rules through games, drills, and scrimmages. Youth programs are also a way to foster health, independence, and confidence. Trained coaches create a positive environment where children can learn to play safely while they learn to love one of the fastest growing sports in the United States. Last year, the Glendale Raptors Rugby Academy tried something new. They developed and ran a one-day clinic during which young athletes spent an entire day honing a particular skill — tackling. The tackling clinic allowed young athletes to dive in deep, working with Raptors players and coaches, to learn how to tackle safely and more effectively. The clinic was popular not only with rugby players, but also with youth who play football. Rugby tackling skills have been embraced by the Seattle Seahawks, among other types of athlete, including kick boxers, soccer players, and cross country runners. Responding to the demand for more programming like that, the Academy has developed a lineup of specialty clinics, six in total, to offer this spring. This year’s clinics began on March 8 and run through May 25. Every other Wednesday evening, a different skill is taught. The particular skills that will be taught include: tackling; catching, passing, and decision making; running support lines and assessing options during gameplay; kicking; effective backline play; and forward play, scrums, and line-outs. Jenna Anderson has worked with youth programming at Infinity Park since 2008 and is currently program director. She said the programs are designed for all skill levels. The amount of individual skill building exercises and small group drills allows a range of skill levels to train at once. In fact, one of the clinic’s biggest selling points is the high level of coaching that young athletes receive on an individual basis. David Williams coaches the Raptors men’s elite team, and he’ll be there. So, too, will be Mark Bullock, the Raptors’ longtime director of rugby and a pillar of rugby in the U.S. Multiple Raptors players, who also must gain certification to coach, will also be on hand. Attending these clinics is also a boon to athletes in other sports. Anderson said that middle school and junior high are key times to introduce students to the value of developing skills in multiple sports. She said there is a trend of students who attempt to “specialize” in a sport sooner than they should. At a young age, becoming a well-rounded athlete will pay higher dividends in the long run than specializing early, a fact that applies to any sport, not just rugby. Although it might seem logical to assume that a student who devotes 20 hours a week to a particular sport will have a leg up over another student who devotes 10 hours to two different sports, the opposite is actually more likely: Avoiding specializing too early actually increases the likelihood for success in the sport a student might eventually end up specializing in. Students who develop skills in more than one sport don’t separate the things they learn in each into silos. Instead, the mental and physical skills they pick up in one sport can be applied to all the others. Think of it as cross pollinating. A football player might become a stronger tackler after learning about tackling in the rugby tradition. A basketball player’s sense of court awareness could develop more deeply after learning how rugby players attack and defend. The possibilities are endless. Anderson said that football players might have obvious interest in the clinics, particularly the tackling and kicking clinics, but she has seen plenty of athletes whose primary sport doesn’t have a clear connection to rugby but who nevertheless attend, broaden their larger sense of athleticism, and have fun while doing it. Clinics cost $20 per session and each clinic takes places from 5 to 6:30 p.m. on Wednesday nights at Infinity Park. Anderson said the clinics are a great lead-in for the Try League Rugby, also offered by the Glendale Raptors Rugby Academy. In this league, players can apply skills they developed at the clinics while playing 7-a-side, or Olympic-style, rugby. Players 5 years and older can sign up for Try League, which begins at the end of April.